Diabetes is a complex and life-altering disease. It affects everything: your eating habits, your immune system responses, and your chances of developing a life-threating condition. The health of your feet is actually a good indicator for the disease’s progression and control in your life. Healthy, well-cared for feet are typically a sign of controlled blood sugar levels. Feet with increasing pain or numbness can be indicative of greater problems. If you are diabetic and experience pain or numbness in your lower legs or feet, you could have diabetic neuropathy, a kind of nerve deterioration. Beyond being uncomfortable, this can lead to a number of serious complications that, if left untreated, can cause injuries and long-lasting conditions with possible consequences like amputation. 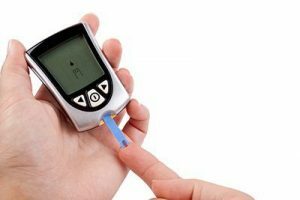 The fluctuating blood sugar levels in diabetes wreak havoc on your body’s structures, including your nerves. Your feet are usually the first to show signs of neuropathy. Common symptoms include sharp pain in the feet and ankles (especially when at rest), sensitivity, muscle weakness, numb spots, difficulty feeling temperature, and difficulty walking. Since your feet lose sensation, you may not notice when they incur an injury, develop blisters or wounds or something more serious. If you continue to walk on that injured foot, what started as a simple sore can become a slow-healing ulcer with high risk for infection or a chronic foot condition. Preventing amputation begins with basic foot care. You should have your feet thoroughly examined every year, even if you do not have any symptoms of nerve damage, to check for diabetic foot changes. Dr. Joel W. Brook, Dr. David R. Northcutt, Dr. Irene Arroyo and Dr. John Baca will look over your feet to check for changes you may not have noticed on your own. They will also test your level of nerve function to catch any early damage. The physicians will teach you how to care for your feet at home, as well as work closely with your primary care doctor to help you develop a comprehensive treatment plan. If you have pain and numbness from nerve damage, you should always wear supportive shoes that also cushion high-pressure areas of your foot. You may need custom orthotics to provide you with the padding and stabilization you require. You will also need to keep your feet clean and dry, so wash them every day. Since diabetics are prone to developing injuries without noticing the change, examine your feet as you wash and dry them. If you notice visible changes, unusual lumps or bumps, cracked skin, or other damage, don’t ignore it. 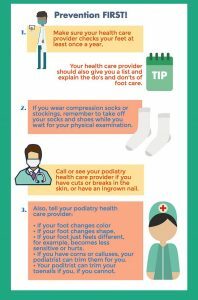 Seek treatment right away so that the experts at Dallas Podiatry Works can help you recover before it becomes a serious problem. The complications of diabetes do not have to take control of your feet. With a little investment and care, you can keep your toes happy, healthy, and ulcer or injury-free. If you or someone you care about have diabetes and have noticed some changes in their feet, especially if they are visible, contact Dallas Podiatry Works immediately for evaluation and treatment. You don’t want to risk the consequences of letting it go. You can reach either of our two office locations by visiting the online contact page or by calling (972) 566-7474 for the Dallas location, and (972) 943-3323 for the Plano office.